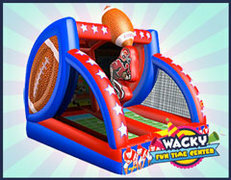 Bounce House & Party Rentals | WackyRentals.com Bloomington IL. This area is for outdoor event and party rentals only. For indoor parties at one of our party centers, select "Indoor Fun Centers" in the navigation menu. 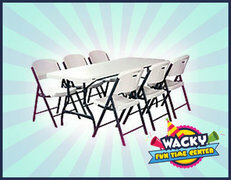 Wacky Rentals now offers complete event and party equipment rentals that we will deliver right to your celebration location. 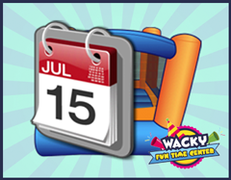 Here you'll find great deals on bounce house rentals, water slides, interactive games and other popular party equipment. 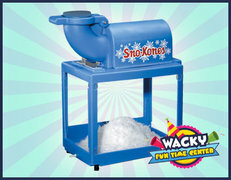 We provide party rental delivery service throughout the Illinois & Central Missouri areas. We specialize in school and church carnivals, company picnics, community festivals, and family celebrations, like birthday and graduation parties. 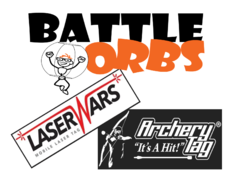 Browse the categories below and see all the exciting items you can have at your event. To check availability or to make a reservation just click the flashing button at the top of the page and enter your preferred date and times. Then as you browse the site you will be presented with those items available on your selected date. Add items you want to rent to your cart. Outdoor rentals pricing is for private at home parties. For all commercial events including corporate, schools, churches and festivals, please call us for pricing.